I love a subway tile bathroom because they have a very contemporary flare but with a traditional base that can coordinate well with nearly any style home. Even better, they appeal to a large audience, so resale is generally a breeze. A marble bathroom like this is one of my favorite ways to use subway tiling because it adds a bit more elegance to the space than your typical white options. It pairs very well with a variety of bathroom flooring styles including large square marble tiles, wood, and even some more eclectic mosaic looks. My favorite way to utilize marble tiling like this is to pair it with a nice deep grey wall paint like Benjamin Moore Storm and bright white trim and panelling. Bucking the growing minimalist trend, our client opted for this refreshing bathroom makeover that subtly blends classic relaxation and modern technology while exaggerating otherwise small space. The patterned bathroom floor tiles set a distinct tone for the design by subtly combining with the off-white ceiling and wall sections. To accentuate the space, the mirror occupies an entire section of the wall, also doubling as a light reflector. To conserve space, however, the brown texture colored marble-top washbasins form a part of the compartments housing the drawers. Not to be outdone, the shower compartment features a stylish fusion of glass doors and beautiful shower tile interiors while its exterior blends effortlessly with the decor. Set within a structure of knee-high bathroom wall tiles, the porcelain jacuzzi-type tub provides a statement of modernistic taste and rising above it to waist level is a continuous panel of the same textured tile. This remodel is a dream when it comes to aesthetics. The grey bathroom tiles throughout give off a sleek marbled look that is neutral, versatile, and definitely on-trend. It is refreshing to see a modern tub away from the wall, especially without excessive hardware. The stunning shower tile designs give the space a special visual detail without feeling too busy, which can be tricky to achieve in planning. A grey and white color scheme is something I would love in every room, but this works extremely well with creating a light, cozy-yet-sophisticated atmosphere. The storage and vanity area makes the entire space feel functional, a quality that I feel is overlooked during renovation. This particular client was trying to make the most out of a small, outdated bathroom. 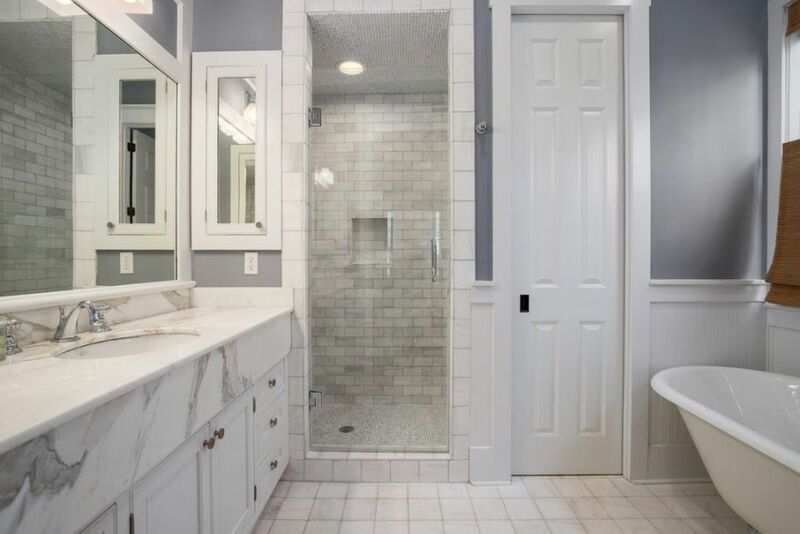 After we gutted the walls and put up new drywall, we wanted to explore using the sleek, sophisticated look of a neutral color scheme with the bathroom tiles design. I chose a unique, doorless shower to keep the space open without taking away privacy, and the bathroom layout needed a strong atmosphere to highlight the rich mahogany sink. Sticking with the neutral tones allowed the bold wood fixture to really speak for itself in beauty. A slate tile was used for the floor design as well as the shower wall tile, but in contrast, I installed a lovely marble counter. Selecting bathroom shower tile is a very important decision whenever you are taking on a remodel because plays a significant role in the overall decor of the space. Bathroom wall tiles are very similar to paint color in that establishes the design foundation for a room. 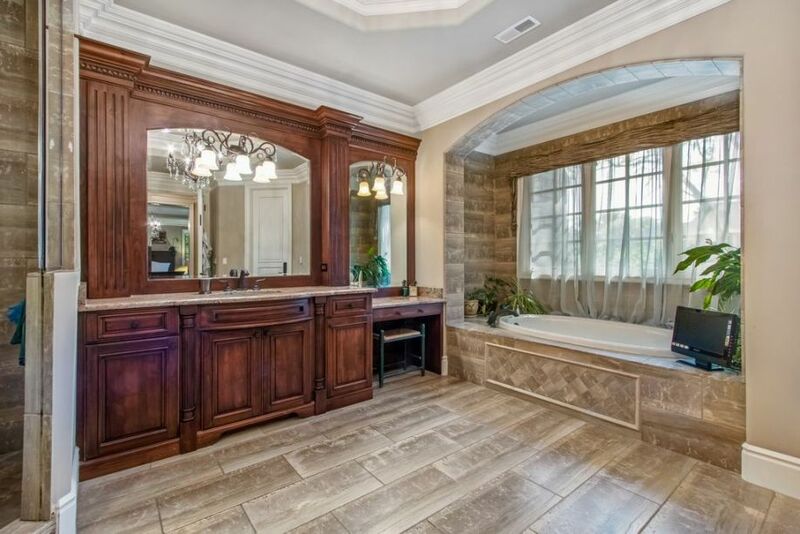 Because bathroom ceramic tile covers so much of the space -- between the flooring, shower, tub and perhaps walls -- the color and finish you choose is very influential. For this luxurious master bathroom remodel, we wanted to create a look that was classic and elegant, but that had touches of contemporary decor to make the style more universal. 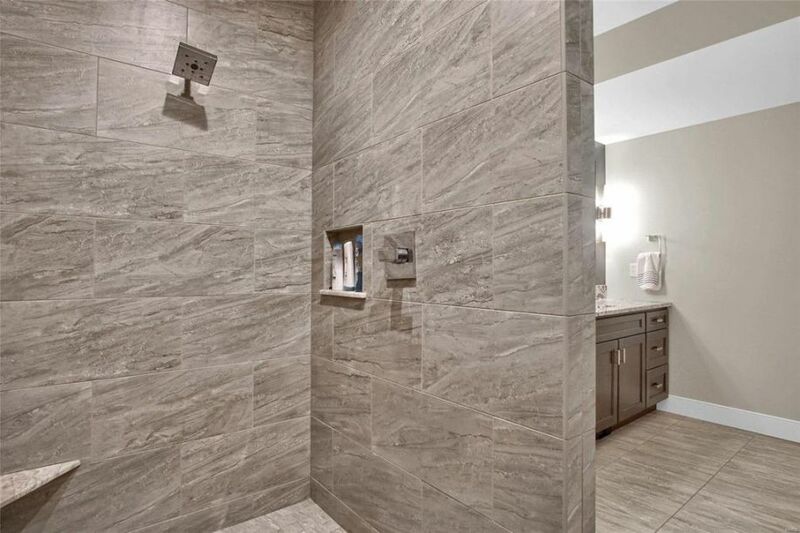 We went with a beige tile for the shower and jacuzzi surround that has beige and grey undertones that perfectly compliment the rustic woodgrain look tiling on the floor. Bathroom art, fittings, and tiles blend to make the entire space lovable. The small shower tiles on the floor and on the back-wall draw attention to the grout lines in a dramatic way. Harmonizing the space with a grout that’s the same color as the shower tiles, the design creates a cohesive and more deliberate look. This appeal comes with increased slip resistance as the grout lines create more traction with the feet. As well the shower design uses large and matching bathroom tiles for the walls and ceiling. These large tiles create seamless and continuous surfaces that lengthen the room size visually. 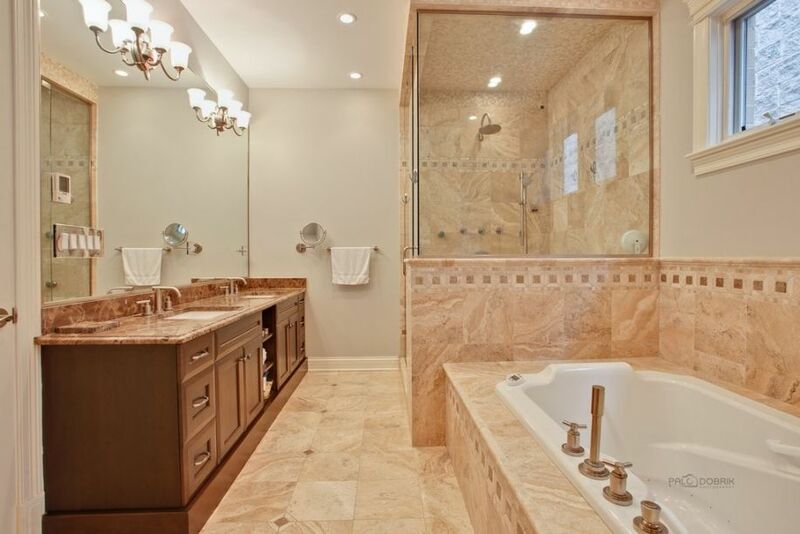 They make the shower space feel larger and harmonized with the rest of the bathroom.